Patersonia are referred to as Native Iris or Flag Iris, and Patersonia occidentalis is perhaps the best know. Found in many areas of temperate Australia, mainly New south Wales, Victoria, Tasmania and South Australia , although P. xanthina and P. occidentalis are both species from Western Australia. All species are clumping tufted perennials with large flowers from spring to early summer this is a hardy plant that requires little car once established. Flower colour varies from purple to white with yellow flowering species available, however less common. Species do vary in height from around .2m to 1m with P.sericea being very low growing. Patersonia are a clumping plant and look great in the garden. A sunny position in a moist soil is required, most species, including the popular Patersonia occidentalis, do not like to dry out completely even in summer. These are a good rockery plant, they tolerates full sun however moisture and some extra water in dry summers is advisable. P. fragilis has purple flowers, an interesting feature is the leaves which appear twisted..
P. glabrata is from New South Wales and Victoria, deep green foliage and pale purple flowers. P. xanthina is a spring flowering yellow species that grows well in light shade. P.longiscarpa is a very attractive species, upright and with good clear flowers in spring. 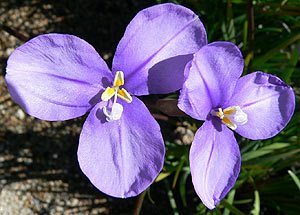 P.sericea is also known as the ‘Silky Flag Iris’, purple flowers and low growing.